Currently used methods of powder surface treatment are based on heat activation of the particle surface in ovens (furnaces) or by direct flaming. Both methods are significantly limited for polymers because of the heat degradation of the modified material. Therefore the cold plasma discharge processes are used in this field. The plasma discharges are also used for surface cleaning. Contamination like oil, grease, fatty acids, dust or bacteria can be removed. The surface is cleaned by impinging active ions and then separated contamination is sucked off. It is used mainly prior to bonding or final treatment such as lacquering, printing etc. 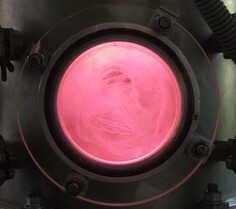 The plasma processes are based on creation of active particles (ions, exited atoms, radicals, etc.) by the working gas going through plasma discharge. These particles are for example able to create layers, cause chemical reactions or to be active participants of such reactions. Concerning our processes active particles of working gas created in the plasma discharge cause reaction on the polymer surface, when new functional groups are bound on the polymeric chain. These are mostly OH groups. Chemical structure of the particle surface is changed from non-polar to polar and hydrophobic material becomes hydrophilic. As the effect is required change of surface energy resulting in higher wettability and very good dispersion capability and/or enhancement of adhesion properties of the polymer towards to other materials. 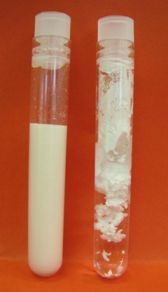 Reaction of distillated water drop on the surface sintered from untreated powder (on the left) and on the surface sintered from plasma treated powder (on the right).